Living in the countryside completely transformed my approach to cooking. The question is not any more “What shall I cook today?” or “What do I find today on the market?”. Cooking starts now for me first by going to the garden, looking around and thinking. Although in the first year of our countryside living we started with a small kitchen garden which limits me but still it is not impossible to cook in harmony and rhythm with nature. 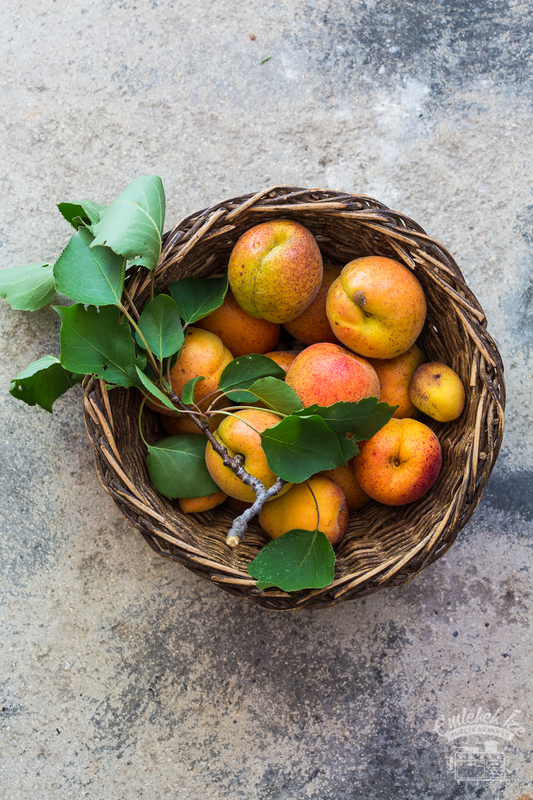 Cherries are gone but apricot is already ripe. András who took care of our fruit trees started pruning our apricot tree as last, so he couldn’t give it a completely new form. 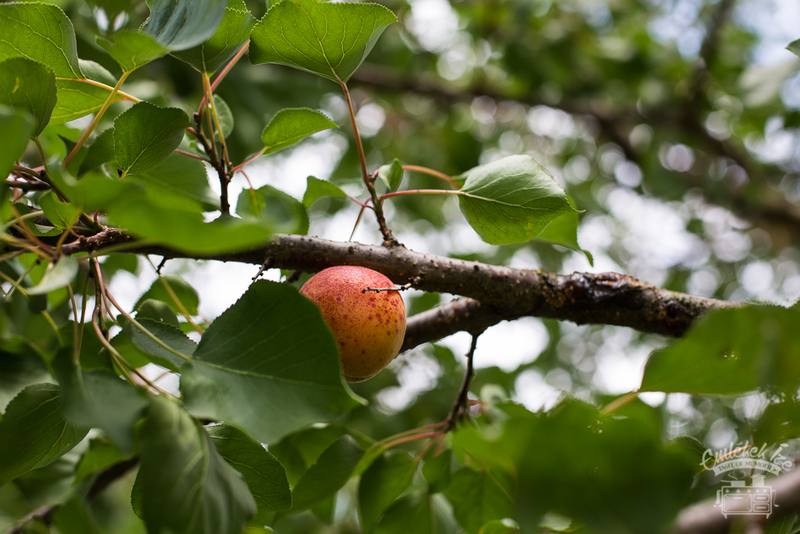 It is still the second highest apricot tree in our village, according to András’s estimation who knows the village’s fruit trees better than anybody else. We could be proud because of this fact, but it basically means that all fruits are on the highest branches and even with my tool which is 3 meters long is difficult to pick the fruits. Finally I succeed to pick all ten pieces of fruits that are on the tree because one really cold spring night unfortunately most of the flowers froze. I realize this won’t be enough for two people so I look around in the garden what else I could find. 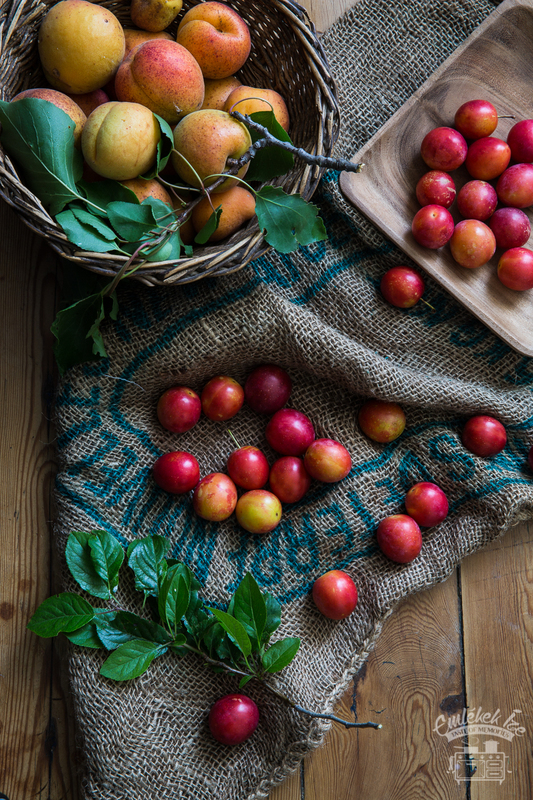 In the middle we have a cherry plum tree which is normally not really esteemed but I get enthusiastic about it, pick some and go directly to the kitchen with my newly found treasures. 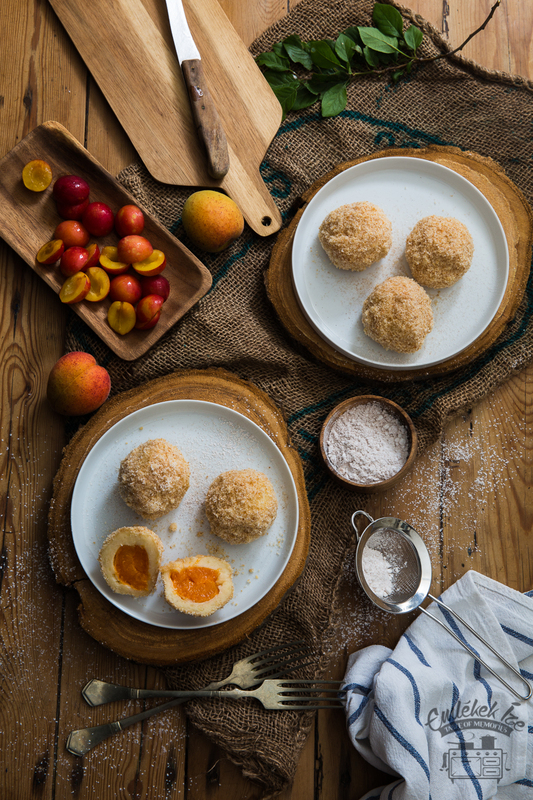 I cook cherry plum and apricot dumplings, a Hungarian speciality which is widely known when it is made with plums but we can try something new, right? Cooking gombóc at first sight seems to be difficult to prepare but is quite easy actually. The longest part of the process is when I cook the potatoes and let them cool down. Then I can knead it, roll it out, fill it, shape it and drop it into boiling water. It only needs a bit of toasted fine breadcrumps and sugar with cinnamon. While we are eating the dumplings I realize that this is a mutual process: we take care of the garden and the garden takes care of us. And in this context we really have nothing to complain about. Cook potatoes in salted boiled water and let it cool down. Peel it and grate it roughly. 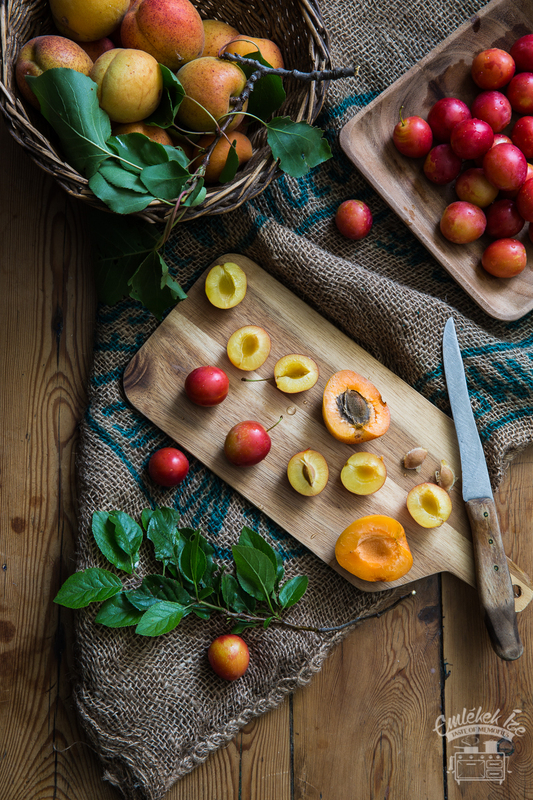 Wash fruits, cut cherry plums in half, apricots in quarter, remove seeds. Mix butter with the flour first then add semolina, salt and finally potatoes and egg yolk. Knead it to a soft dough. It will be a bit sticky but don’t worry you will need only a bit more flour when rolling out. Roll it out to half centimeter thick and cut 8 cm edged squares, I got fifteens of it. Put a bit of sugar in place of the seeds and push two pieces together. 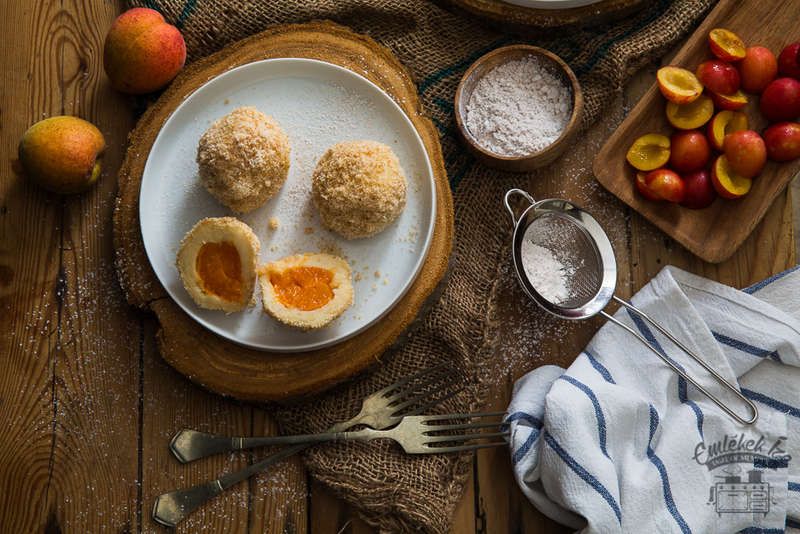 For one dumpling, use two halves from the cherry plums and two quarters of the apricots. Pinch the four corners together and form a ball in your palm. Be careful that you don’t leave any holes. Work possibly fast, because fruits will release some liquid by adding sugar and it can make it difficult to close the holes. In that case use some flour to help yourself. Melt 25 g butter in a pan and toast fine breadcrumbs. Boil water in a large pan with a teaspoon of salt and drop dumplings into it (cook them in two bunches). Wait until they come up to the surface and cook them for further two minutes. Remove them with a sieve and roll them into fine breadcrumbs carefully without breaking them. 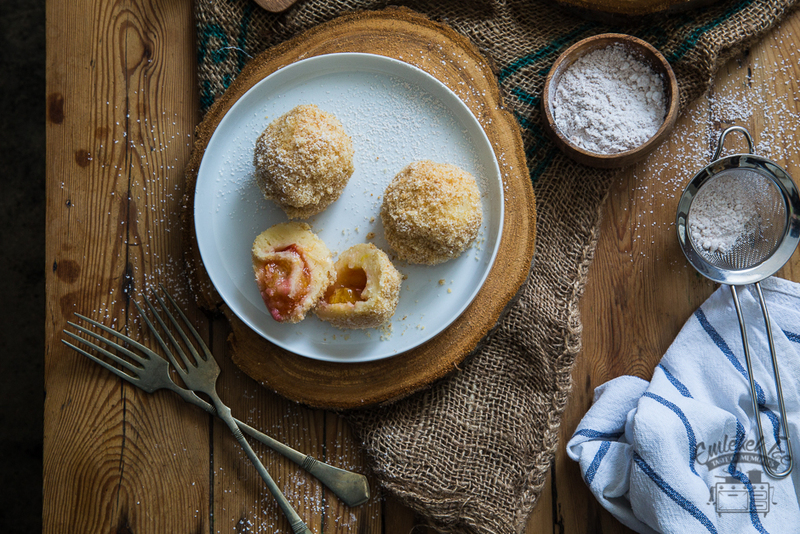 Mix some confectioner’s sugar with ground cinnamon and serve it with the dumplings.